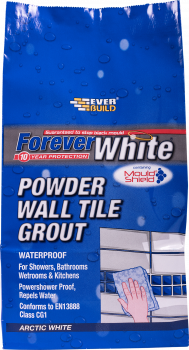 Forever White Powder Wall Tile Grout is a cement based powdered grouting compound with added PVA to promote adhesion and water repellents to shed water. Simply mix with water to give a pure white paste. Can be used on wall joints up to 3mm. Contains Mould Shield® for long lasting protection against discolouration caused by bacteria, mildew and mould growth. Waterproof for showers, bathrooms, wetrooms & kitchens, powershower proof, repels water.